A company page allows LinkedIn members to learn more about your business, and is a great way for companies to build and maintain a helpful community around its products and services. By frequently posting to the company page, viewers and followers are able to stay engaged, and can allow for the posts go viral through likes, shares and comments. 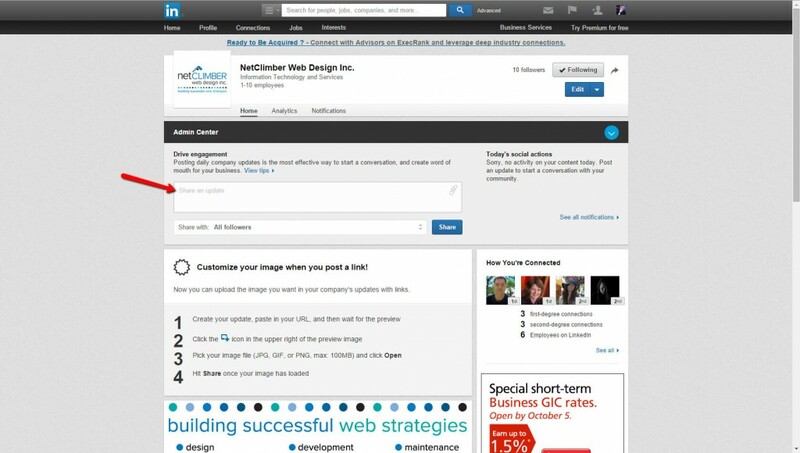 Here are the recommended steps to adding a post to your LinkedIn Company Page. Step 1 – Sign onto your LinkedIn account, mouse over your profile settings in the top corner, and select the menu item Company Page – Manage. Step 2 – Click in the Drive Engagement comment box near the top of the page (indicated below). Step 3 – Enter the details of your blog post, or, if you’d like to share a blog post, cut and paste the URL from the blog entry that you would like to post. As soon as you paste this link into the Drive Engagement comment box, the link will resolve (the area below the Drive Engagement comment box will be populated with information from your blog post) – see arrows below. Don’t do anything further until this process is complete. It can sometimes take a few seconds depending on your internet connection. 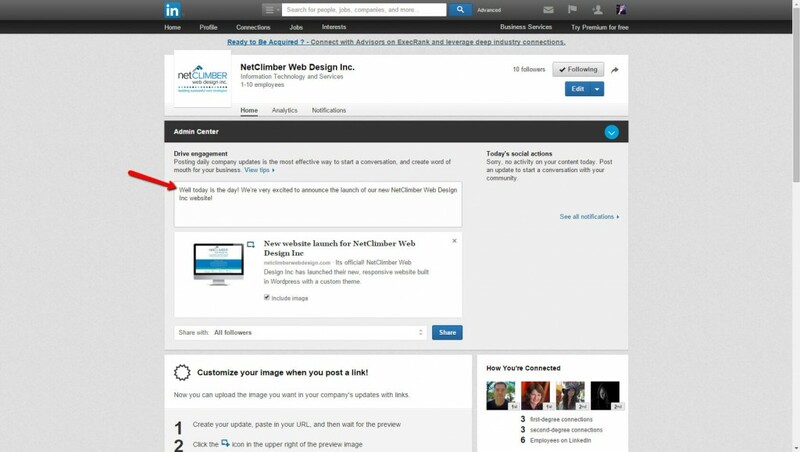 Step 4 – Hover over the image box until the phrase “Upload Image” appears (see 2nd screen shot below). Step 4 b – “Upload Image” text appears in image box. Step 5 – Click the Upload Image text. Navigate through the documents on your computer to select the image you would like to use. For best viewing the image should be 180 pixels x 110 pixels in size. Step 6 – Now you want to add the teaser for the post. At this point you can remove the URL and enter the post teaser. You are going to type over the URL that is indicated by the red arrow below. Step 6b – Enter the teaser into the Drive Engagement comment box on top of the URL – see red arrow below. Step 7 – Time to share the post. Click the Share button – indicated below. Blog Title – If you click the blog title “New website launch for NetClimber…” this link will go to the specific blog post as well. By following these steps, you will successfully be able to post company updates, news, job opportunities and so much more to your company LinkedIn page!